Many modern horse sports, whether English or western, evolved from long-standing traditions or practical horse uses. For example, traditional fox hunting mounts couldn’t spook at dogs or distractions in the woods, and ranch horses had to be comfortable around cattle herds. Horse sorting gives western riders a way to relive a ranching tradition in a fun and competitive environment. Your objective in horse sorting is to move specific cows out of a group of 10 to 12 from one pen to another while on horseback. Typically this is done with a teammate, but there are one-person competitive versions. It may sound easy, but the cows are numbered, and they must move through the new pen in numerical order. Three other factors add to the difficulty level: You are given a maximum time of 60 seconds but rewarded for the fastest time; there are “trash,” or unnumbered cows that cannot go with the numbered cows into the target pen; and riders cannot touch the cows. Ranchers and cowhands performed sorting as part of routine ranch work, and modern working ranches still use it. Young or new cows that have not yet been branded must be sorted out from the branded cows and corralled into a pen for branding. Unvaccinated cows are sorted from their vaccinated brethren in the same manner so that vaccines can be administered. 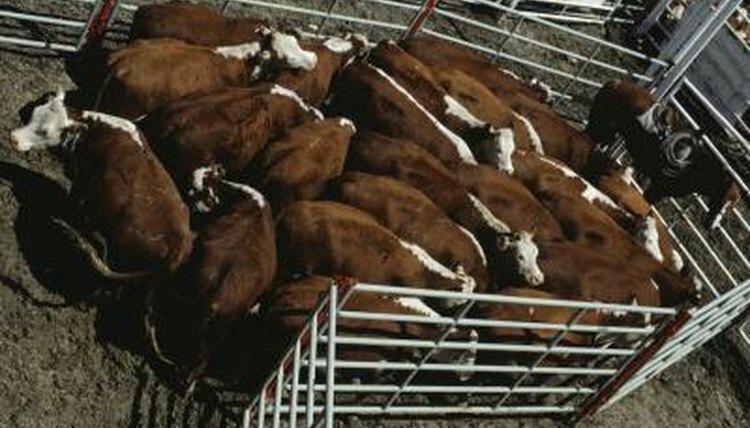 Sorting is also used for cattle that are being delivered to market for sale, slaughter or medical attention. It takes a horse with a special mind to excel at sorting. Quarter horses are commonly used, but the breed doesn’t matter -- the brain does. A quiet mind is also a must; they get excited about moving the cows without being distracted by crowds, noise and arena lights. Good sorting horses -- many of which are bred for their instincts in shepherding cows -- understand their job is to move the cows. They are competitive like their human riders and work hard to keep the cows from going astray. They are nimble, stopping quickly on their hind ends and changing direction in the blink of an eye. Penning is a sport very similar to sorting in that certain cows must be moved into the target pen. There is no source pen -- the cows are just herded from the arena into a penning area. Additionally, the size of the herd doesn’t matter, but the numbers do: Penners must only herd and get specific numbered cows into the pen. They don’t need to be in a specific order, just the specific numbers matter. There are three team members in penning versus one or two in sorting. National Sorting Cow Horse Association (NSCHA): What is Sorting?